Buttermilk helps keep these scones light. The orange zest adds a tropical fruit note but you could substitute lemon. See other tips at end of recipe. 1 Preheat oven to 220°C (425°F). Sift flour and sugar together into a large bowl. Rub in butter (see notes). Add dates, orange zest and walnuts. Mix in buttermilk with a fork. Tip dough onto a lightly floured surface, gently pat into a cake – it will be very soft and sticky – and cut into 12 rough shapes with a floured knife. 2 Transfer to a tray lined with baking (parchment) paper. Bake for 12-15 minutes, until golden. Serve warm with butter. Recipe notes below (scroll down). 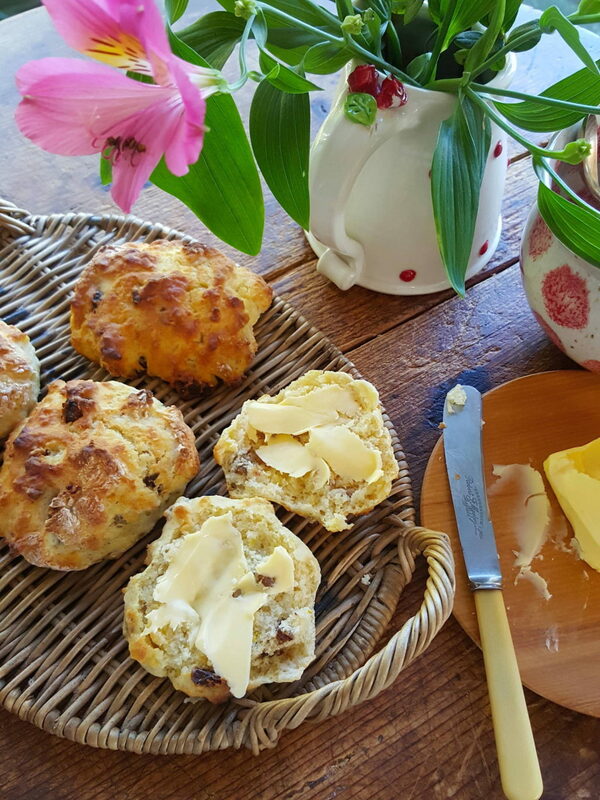 Scones are best baked immediately after mixing, and in a hot oven, to ensure maximum rise and lightness. They are generally low in fat and sugar – two ingredients which help keep baking tender and moist – and are best consumed the day of making. I use a pastry cutter to break up the butter, but you could use two round-bladed knives (one held in each hand put into the centre of the bowl with the blades facing outwards, and dragged through the ingredients until the butter is cut into small bits). Both these methods are better than using your fingers because metal keeps the butter colder and prevents it from oiling in warmer weather. 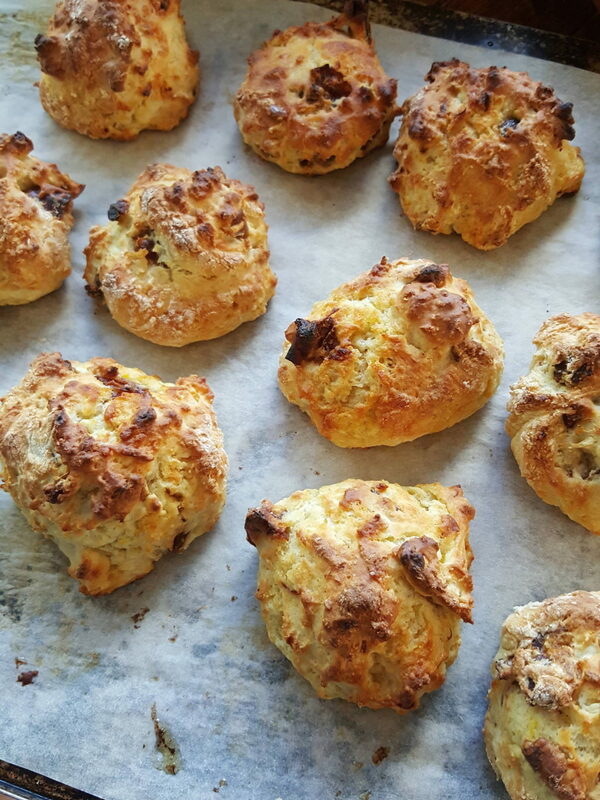 Another tip – don’t over-mix the scone dough. Work it just enough to come together. And a sticky dough is better than a dry dough (a dry dough is easier to work with, but it will produce heavier scones). Use a floured knife to cut sticky dough into rough shapes, handle lightly, then transfer to a cold baking sheet (just as for biscuits, use a cold tray and bake in a hot oven). 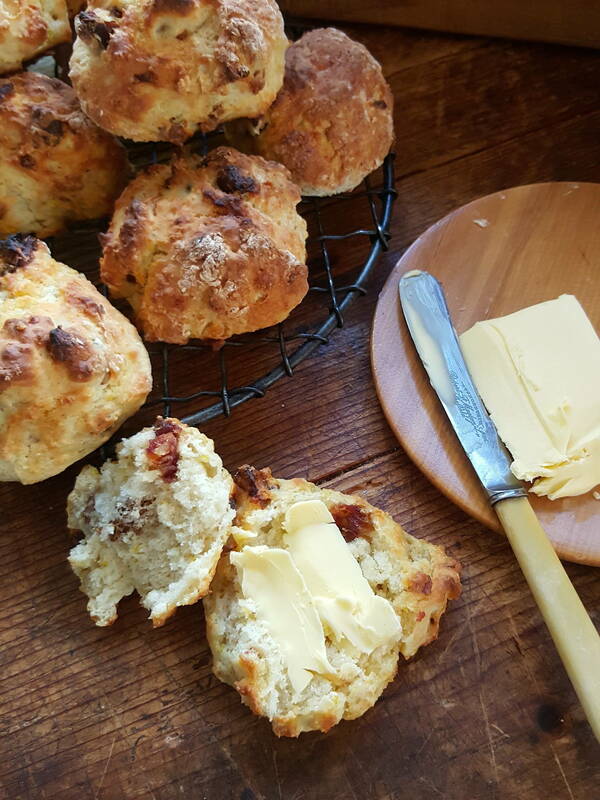 Don’t fiddle with the scones – rough shapes, which are light, are better than heavier perfectly shaped scones. Be sure to use fresh, soft dates (semidry dates), not hard dried sugary dates. Cut them in half and remove the pits, then chop. 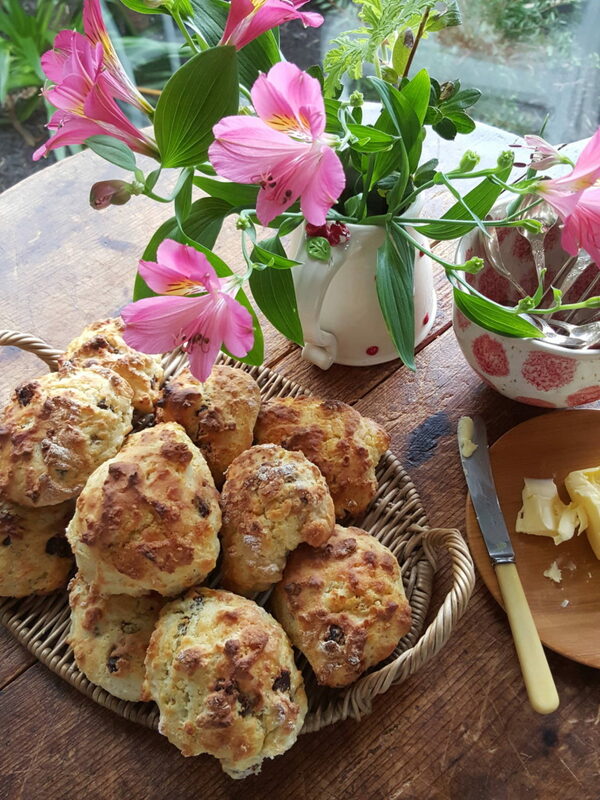 And be aware, that any large pieces of date exposed on the top of the scones can burn, so use a skewer to poke them into the scone mixture. Don’t be stingy with the butter!